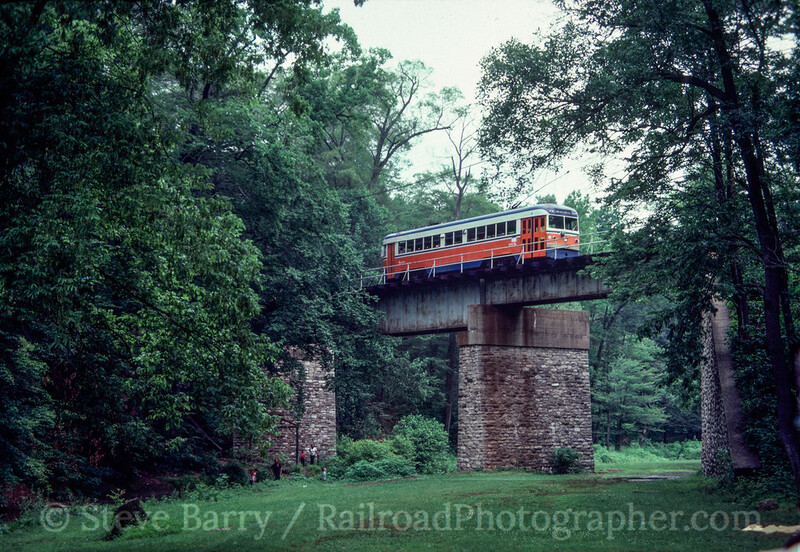 The Electric Railroaders Association held its annual convention over the July 4th weekend of 1981 in Philadelphia. I was just out of college and just beginning to explore the Philly rail scene, so I signed up for the three-day event. Looking back, that ERA convention was really the final showcase for the "classic" Philadelphia transit scene. Everything would look different in just a few years. 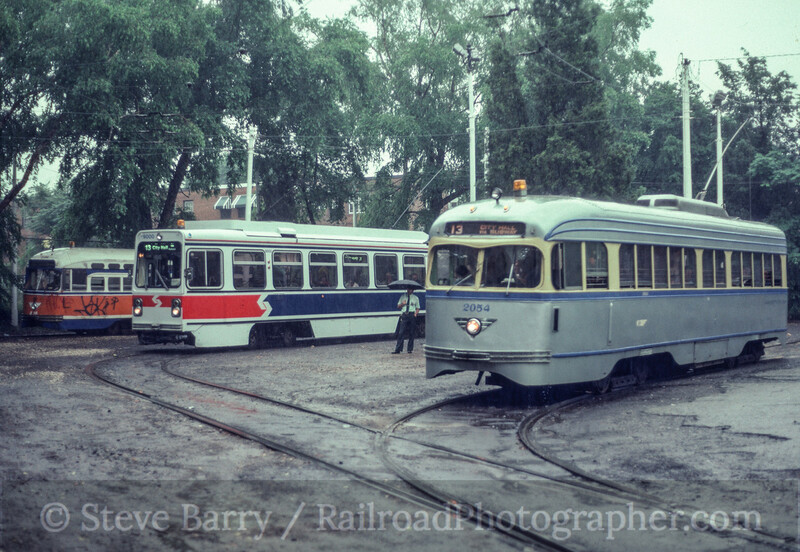 The City Transit Division hosted a couple of streetcar trips, highlighted by a three-car charter featuring SEPTA's Training Trolley (note the trolley painted on the trolley), a PCC in the new simplified red, white & blue SEPTA scheme, and a car in Bicentennial paint (even though the Bicentennial was only five years previous, these cars' paint jobs were already starting to show some wear. 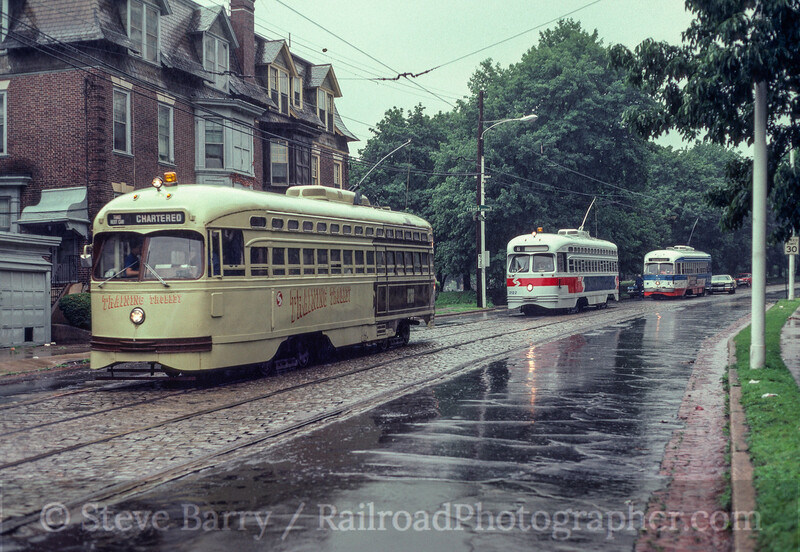 The three-car consist posed on Ogontz Avenue (above). These tracks -- and indeed, even the buildings in the background -- are no longer there. Another trip featured old and new streetcars. SEPTA had one PCC painted in the Philadelphia Transportation Company silver paint and it teamed up with Kawasaki car No. 9000 -- the first Kawasaki car on the property -- for a trip. 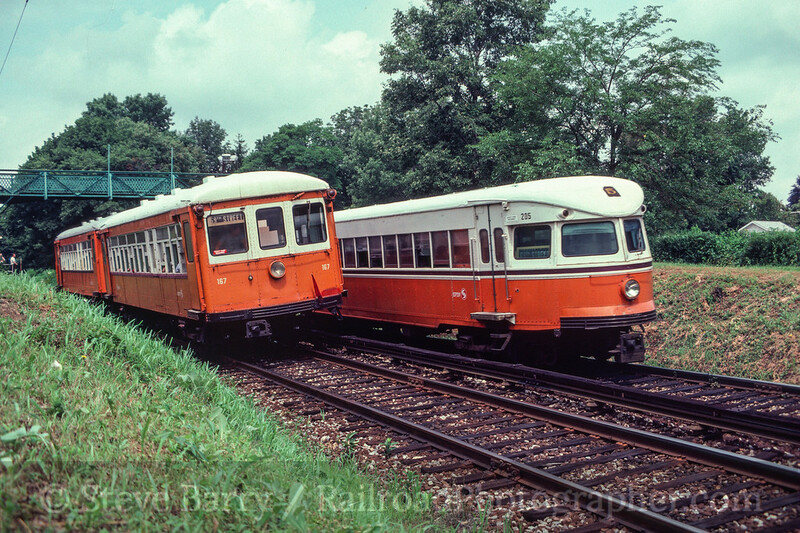 A car in regular service in the orange and white "Gulf Oil" scheme can be seen with the two cars on the charter below. No. 9000 was not in revenue service at this time, but was out for the trip. One of the trips must have paused on Route 23 where Germantown Avenue (the street Route 23 used in North Philadelphia) crosses Broad Street and Erie Avenue in North Philadelphia, as I have shots of a few regular service cars here. First up is PCC 2270 in the Bicentennial scheme heading south. 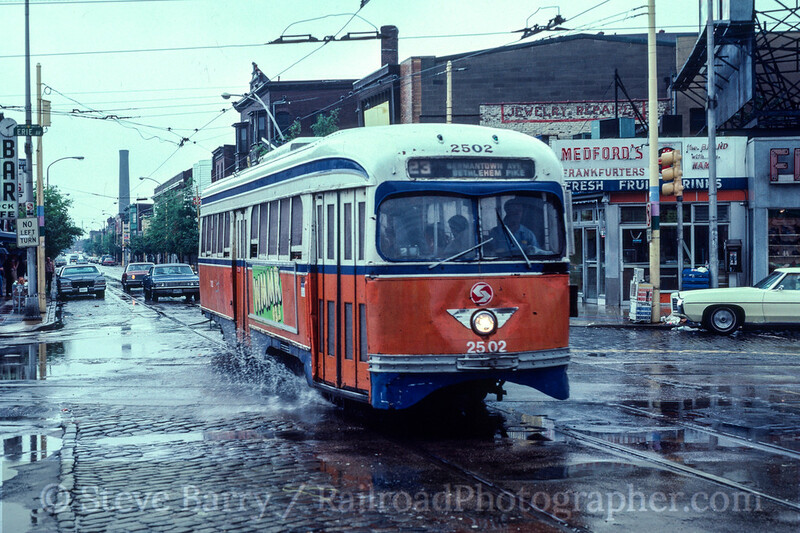 At the time, Route 23 was the longest streetcar route in North America, stretching from Chestnut Hill in the north almost to Veterans Stadium in South Philadelphia. And up next we have car 2502 in the Gulf Oil scheme heading north up Germantown Avenue. As can be seen here, it rained throughout much of the convention. The convention also featured SEPTA's Red Arrow Division, which heads out of 69th Street Terminal in Upper Darby. Red Arrow consists of the light rail/streetcar hybrid lines to Media and Sharon Hill (which share tracks as far as Drexel Hill Junction) and the interurban Norristown High Speed Line. The Media-Sharon Hill lines would have new equipment in about a year, but the old stuff was still in service during the convention. St. Louis Car Company Streamliner No. 18 (built in 1949) was at 69th Street during the convention in regular service. 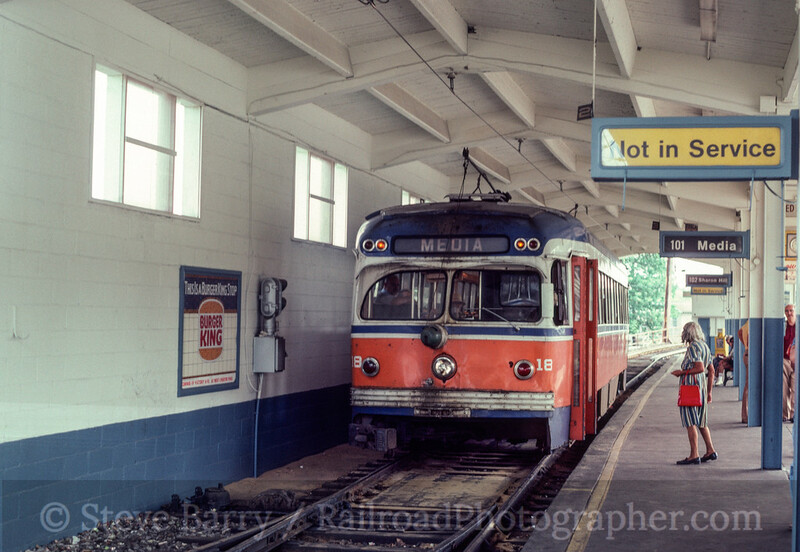 In addition to the St. Louis cars, the Media-Sharon Hill lines also used "Master Units" built by J.G. Brill in 1932. Nos. 83 and 84 were sitting just outside the terminal. Brill car No. 78 was used on an excursion during the convention. A photo stop was held at the Drexel Line station. A couple of coeds made an appearance during the stop. Also in use on the lines were "Brilliners" built by J.G. Brill in 1941. Brilliner No. 8 posed at SMedley Park in Springfield on a charter. 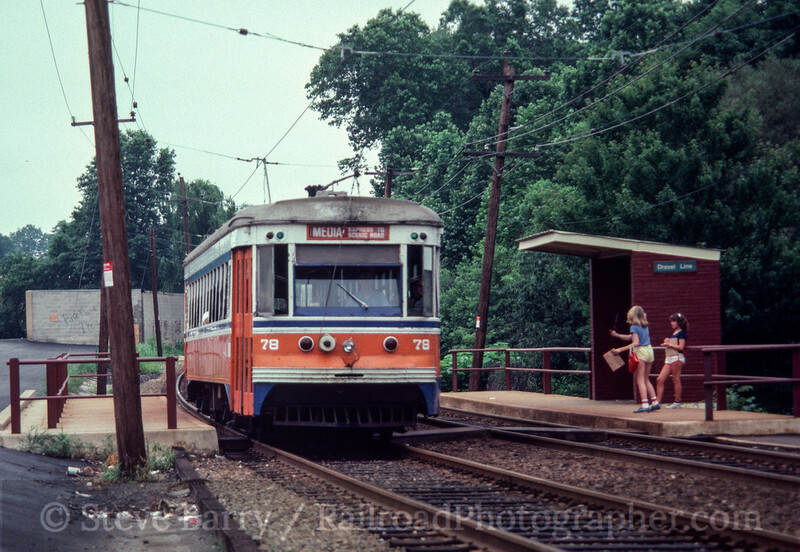 Smedley Park is still one of the favorite photo spots for SEPTA charters. A trip was held with the very old and the very new, with a photo stop on the Sharon Hill line crossing Darby Creek in Drexel Hill. Car No. 100 is a brand new car from Kawasaki that was not yet in revenue service but was used on the charter. Car No. 73 is a center entrance interurban built by J.G. Brill in 1926; by this time the car was only in charter service. 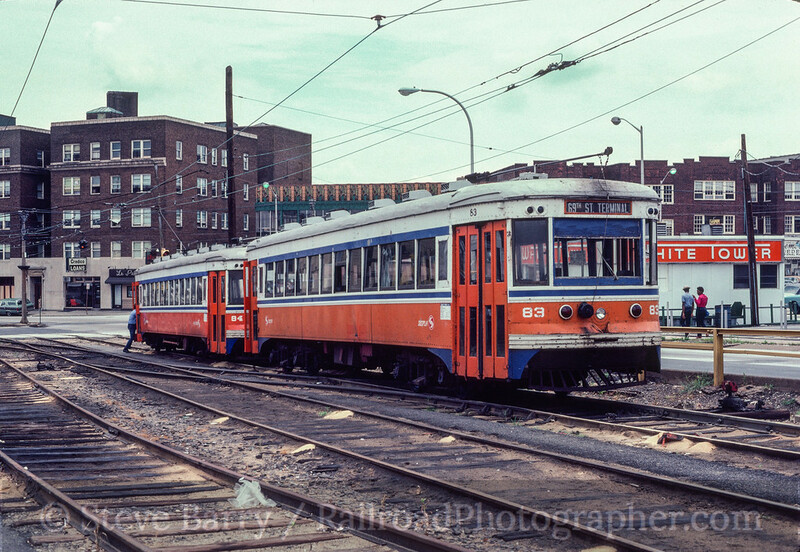 Getting back to Upper Darby, 69th Street was one of the most diverse rail transit centers anywhere with multiple style cars used on the three Red Arrow lines, plus the Market-Frankford Subway Elevated has its western terminus here. The MFSE shop is also located here, and a peek over the fence revealed a multitude of "Almond Joy" (because of the bumps on the roof) rapid transit cars. 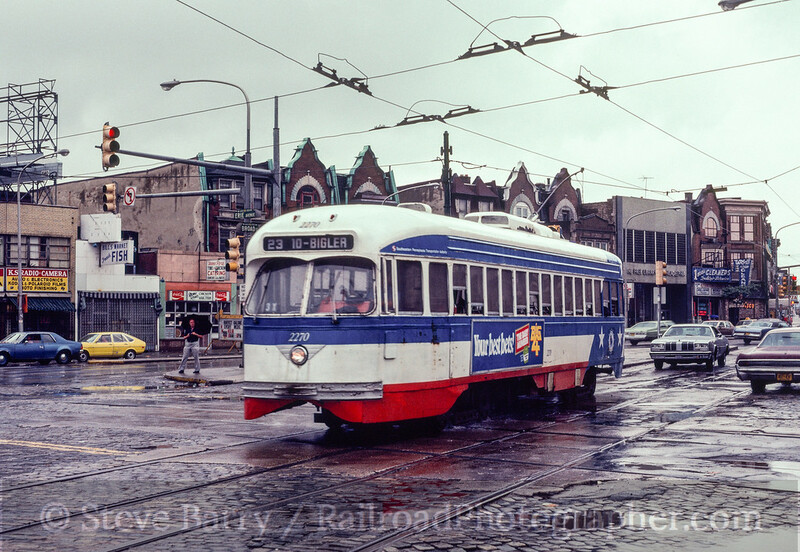 The Norristown High Speed Line (also known as the Philadelphia & Western and a part of Red Arrow) headed towards its namesake town from Upper Darby and used two kinds of cars built by J.G. Brill. The boxy Strafford cars were built between 1927 and 1929 while the futuristic Bullet cars were built between 1931 and 1934. 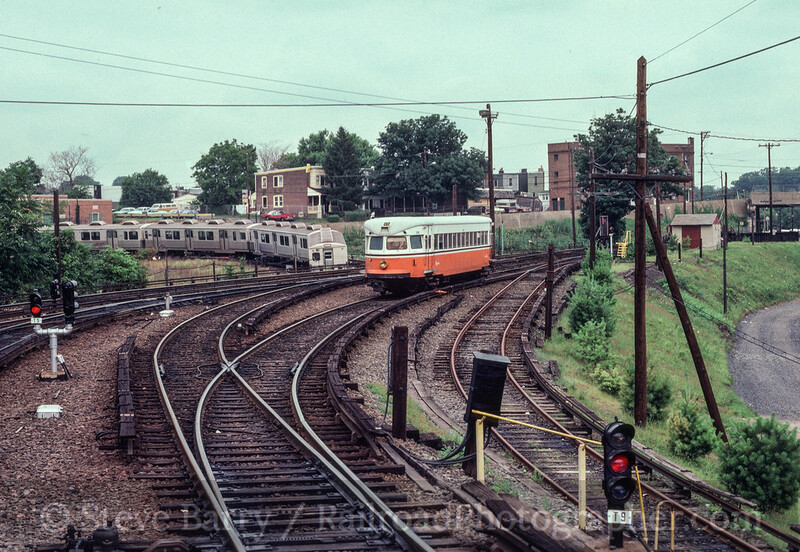 The P&W passed the Market-Frankford line's turning loop as it left 69th Street. An arriving Bullet is seen below as a MFSE train uses the loop. One of the fantrips featured two Strafford cars together (most P&W operations used single cars). At Villanova the cars were posed while a regular service Bullet car ran past. A photo stop was also made at Radnor. I don't recall if the Bullet car in the photo was used on the charter or if it was a regular service car that went past during a photo stop. The tracks overhead are the former Pennsylvania Railroad main line from Philadelphia to Harrisburg and points west, used by SEPTA's regional rail and Amtrak. 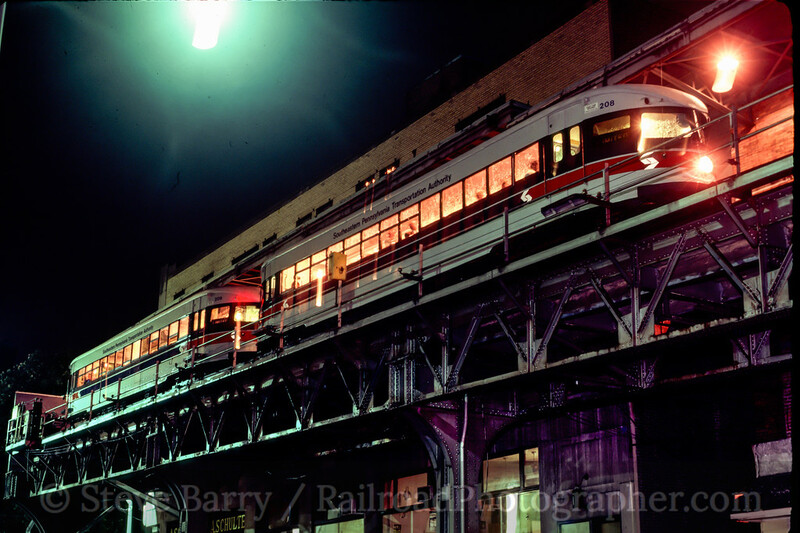 One of the highlights of the convention was an after-dark non-stop run from 69th Street to Norristown using two Bullet cars painted in the then-new white, red & blue SEPTA scheme. The train rocketed to Norristown, and I remember what a rush it was with the windows open and sparks flying. The train paused at Norristown for a photo (below) and made a few photo stops on the return trip. So here we are almost 33 years later. Virtually every piece of equipment seen in these photos is gone now, save for Kawasaki streetcar No. 9000 on the City Transit Division and Kawasaki Light Rail Vehicle No. 100 on the Red Arrow Division. All the PCC cars, save for a few in charter service, were gone by 1992. 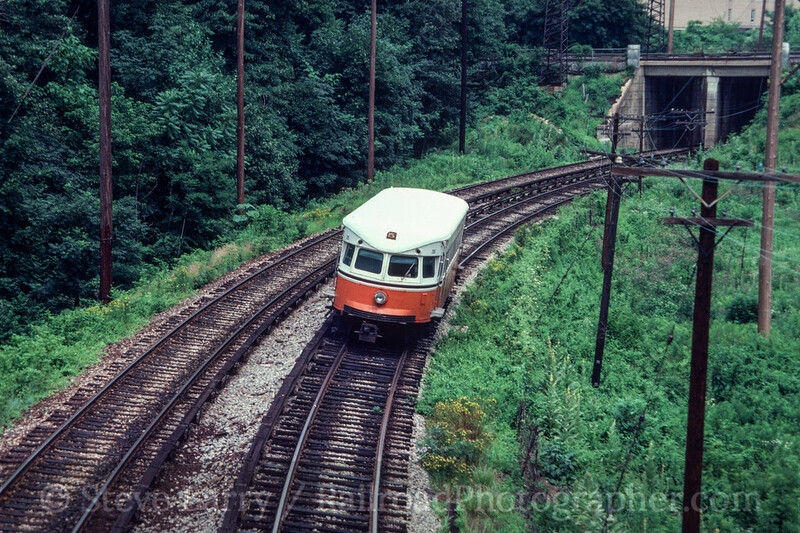 The Brilliners, Master Units and St. Louis cars on the Media and Sharon Hill lines were gone by 1982. 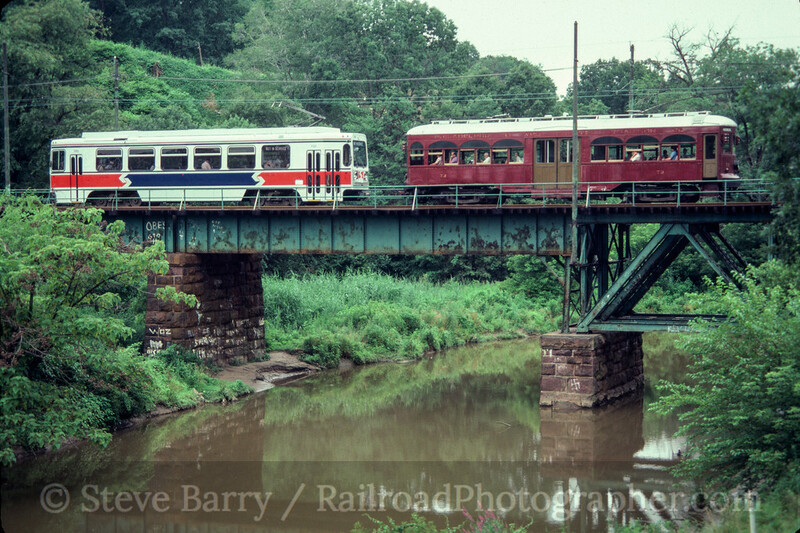 The Norristown High Speed Line was re-equipped with new cars by 1993 (although the Bullets vanished a few years before that). 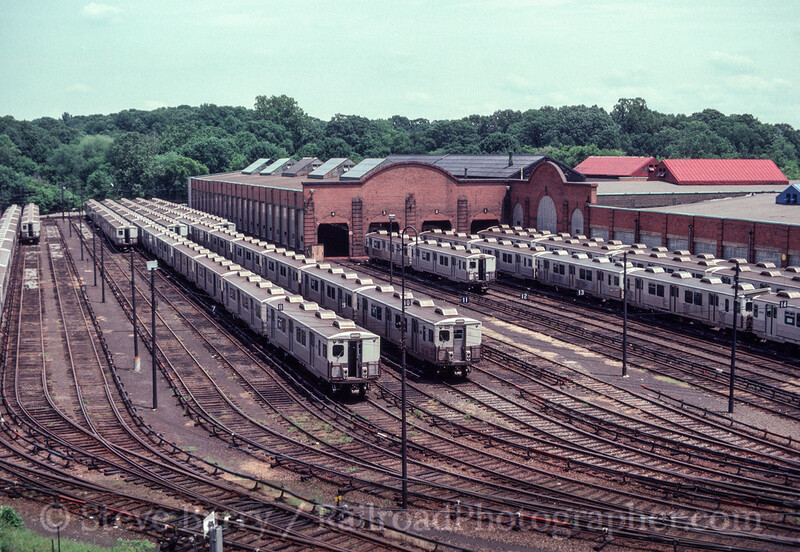 Even the Almond Joy cars on the Market-Frankford line were gone by 1997. A lot has changed. The Electric Railroaders' Association convention of 1981 was, indeed, the last grand hurrah for the classic Philly traction scene.